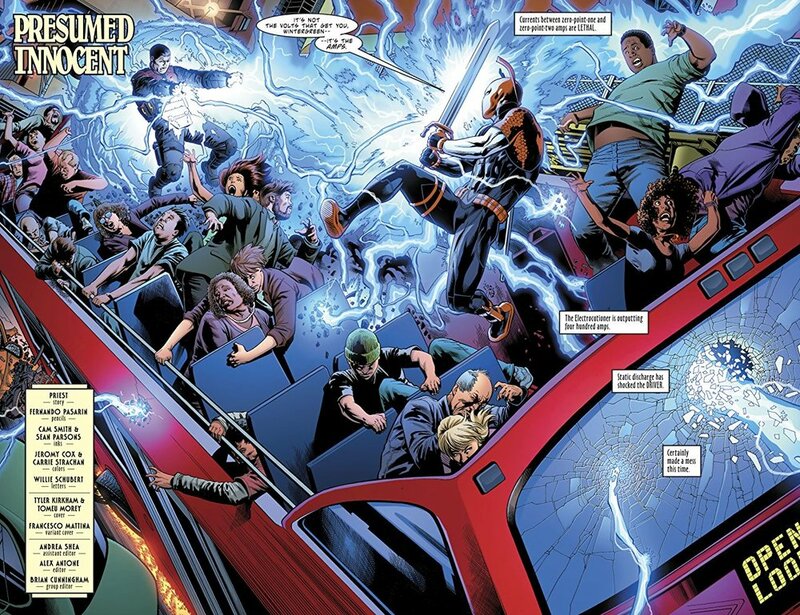 It’s back to business as usual for Slade in Deathstroke #41, written by Christopher Priest, with pencils by Fernando Pasarin, inks by Cam Smith and Sean Parsons, and colors by Jeromy Cox and Carrie Strachan, but the recent topsy-turvy events of his life haven’t left him unscathed. Previously, Wilson was betrayed by his closest allies and sent to Arkham Asylum. There, he was manipulated by Dr. Hugo Strange until he couldn’t tell reality from illusion. Still operating under the belief that he had recently fought off an alien invasion, Deathstroke escaped. Now, on the run from the law, he must try to get back to his job of killing people for money, but without his usual support. This may not have been the most exciting issue of Deathstroke ever, but Priest does an excellent job of using a downbeat chapter to re-establish Slade now that he’s lost the help of Wintergreen. Gone, is the professional vetting and due diligence that his partner provided. Slade must make do with taking missions that may, or may not, line up with his moral code, and it immediately has him questioning his targets. It’s interesting to see a Slade Wilson that’s not as on top of things as he usually is, and this issue is a perfect illustration of how integral Wintergreen was to his operation. Speaking of Wintergreen, he spends most of the issue debating the merits of Wilson with Commissioner Gordon when Deathstroke’s botched mission gains the attention of the GCPD. Seeing these two, both supporters of people who operate outside of the law, take jabs at each other, and question why they do what they do is the highlight of the issue. Gordon and Wintergreen are two sides of the same coin, both willing to step outside of their moral boundaries to bolster men that they believe. There’s no chance either of them is going to change the other’s mind about their partners, but it’s fun to see them bounce off of each other, anyway. The whole issue could have centered around this conversation, and it wouldn’t have suffered at all for it. On the Deathstroke side of things, Slade gets some quality time with his daughter Rose when he is forced to lean on her in place of his usual support. She begrudgingly goes along with his requests, showing that no matter how much Wilson has hurt her over the years, he is still her father, and there is a twisted kind of love between them. Priest plays their connection well, with Rose offering little respect for her dad, and Slade taking her help for granted. There is so much intentional contrast between these two’s actions and their words towards each other, and it encapsulates their relationship perfectly. Pasarin delivers another issue of A-list work, with little-to-no flaws, proving once again, that it’s only a matter of time before a more significant, more famous book comes along to scoop him up. Until then, Deathstroke fans will be reaping the benefits of having the underappreciated penciler on their Title. The same can be said of the inks of Smith and Parsons, and the colors of Cox and Strachan. This whole team, should this book ever be canceled, could easily find work on popular titles that are currently suffering from a weak art stable. All in all, this was a sleepy (but somehow, still action-packed) issue, but it managed to do a capable job of setting up Wilson’s new status quo while teeing up the big Deathstroke/Teen Titans crossover coming up. If you’re a fan of either book or love the idea of seeing Damian and Wilson squaring off again, it should be worth sticking around to see what happens.